Idk if this is just for me, but because of the update released today m0re hud's class selection and team select isn't working. It seems to have been replaced with the default selection screens but they won't work because of the jumble of values it is dealing with. Again idk if this is just for me, and as of now I have only tested m0re hud. Would someone be able to update the Garmen QL Edit that OP Hipnotize posted at the beginning under the, "More Huds Here" tab at the bottom? KmoxyWould someone be able to update the Garmen QL Edit that OP Hipnotize posted at the beginning under the, "More Huds Here" tab at the bottom? 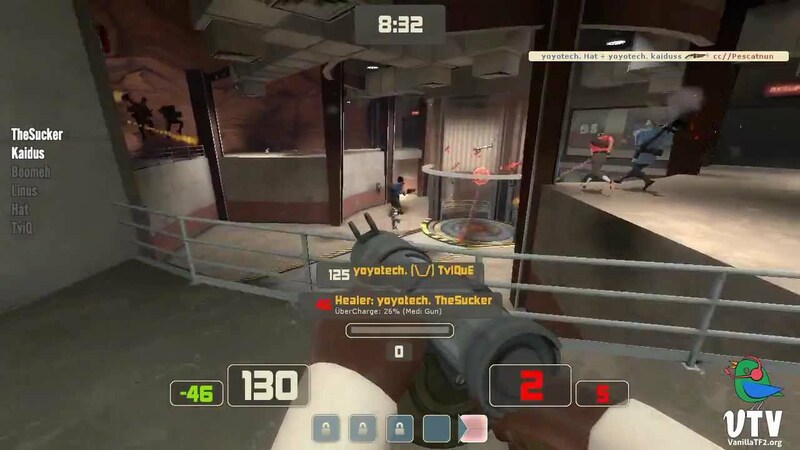 Its already updated, if something is outdated in the hud just let me know I always try to fix everything that people posts. Looks 100% intentional for me. FerretoneSmall extra note about bwHUD Hex, when playing KOTH there's a white line in the top left corner of the screen. About the 4:3 hud adaptations, is not the easiest thing to do and takes time so I don't know if I'll do it for now, sorry! Yo could you do softhud? Appreciate it. knsumeYo could you do softhud? Appreciate it. [quote=knsume]Yo could you do softhud? Appreciate it. heyyy play casual with Crsp Broesel just keep crashing. Karicheyyy play casual with Crsp Broesel just keep crashing. I just tried now and works fine for me, have you tried with any other hud? [quote=Karic]heyyy play casual with Crsp Broesel just keep crashing. Hypnotize Karicheyyy play casual with Crsp Broesel just keep crashing. I just woke up and saw it in there and I can finally play with this beautiful hud once again. [quote=Hypnotize][quote=Karic]heyyy play casual with Crsp Broesel just keep crashing. Also right off the bat, since I'm trying it out right now, everything works great. But a lot of icons still aren't working it seems, as well as some windows. Can you try to reinstall the fonts when you can pls? Because it looks fine for me but it might actually be just on my end. I actually installed them again and it worked for me now, that was weird idk why it didn't work the first time. Anyways thank you so much again! The only things that are still there are just the spec team thing where it says "watch" but there's still an ellipses, and that's about it. The only nitpicky thing I'd have is that the streaming icon is just a bit lower than the rest of the icons haha, I got ocd :P Also one question, so in the hud it shows that it has like colors on the actual panels for items within your inventory. Like yellow for unique items, orange for strange, and also for different grades of items, like elite is red, and commando is purple, etc. Is that something that shows up for you at all? or is it just that that element couldn't be re-implemented? Just curious, cause I saw it in the screenshots and stuff but I don't see it when I go to my inventory in-game. No real worries on that though, it looks perfect! zaboomafooI actually installed them again and it worked for me now, that was weird idk why it didn't work the first time. Anyways thank you so much again! The only things that are still there are just the spec team thing where it says "watch" but there's still an ellipses, and that's about it. The only nitpicky thing I'd have is that the streaming icon is just a bit lower than the rest of the icons haha, I got ocd :P Also one question, so in the hud it shows that it has like colors on the actual panels for items within your inventory. Like yellow for unique items, orange for strange, and also for different grades of items, like elite is red, and commando is purple, etc. Is that something that shows up for you at all? or is it just that that element couldn't be re-implemented? Just curious, cause I saw it in the screenshots and stuff but I don't see it when I go to my inventory in-game. No real worries on that though, it looks perfect! Umh check if you have the border option set to "show quality colors borders" inside the backpack page cause thats the only option that controls it i think and it's also the only thing that comes to my mind really. About the "watch" thing, it looks fine for me as you can see. Post a screen if you want so i can tell if its something on your end or something fixable due to resolution things ect. let me preface this by thanking you again for the amazing work you're doing. if you could fix this, I'd be eternally grateful. Thank you! HypnotizeUmh check if you have the border option set to "show quality colors borders" inside the backpack page cause thats the only option that controls it i think and it's also the only thing that comes to my mind really. [quote=Hypnotize]Umh check if you have the border option set to "show quality colors borders" inside the backpack page cause thats the only option that controls it i think and it's also the only thing that comes to my mind really. Se7enlet me preface this by thanking you again for the amazing work you're doing. [quote=Se7en]let me preface this by thanking you again for the amazing work you're doing. The "Watch" label should be ok now. But i can't do much about the stream icon, it is cause by the lower resolution and the fact that it is a different font from the others, so if i change it for your resolution it will be messed up for higher resolutions for example. You can always adjust it by yourself since it shouldn't be hard. Open the mainmenuoverride.res then search for WatchStreamButton and change the "ypos" to something like "-1" or "-2"
Alright I appreciate the tip thank you very much! And also, since I haven't gotten a response in the other thread, I was wondering if you knew how I could edit/hide the scoreboard labels (name, score, ping) which are shown like halfway on the scoreboard cause of my resolution. I want to fix it so that it's completely hidden or at least I want to know how to like move it and stuff. Thank you again! It seems to only bug on 4:3, is it possible to fix this? Can you update RobotoHUD and ProductHUD, please? is it possible you could do fluxhud?